Should no-decompression diving be renamed no-stop diving? A slow ascent is your deco obligation on recreational dives. Earlier, I was semi-involved in a discussion about terminology regarding no-decompression diving, or diving within the no decompression limits (NDL) that define sport or recreational diving. I suggested that every dive is a decompression dive. I’m not the first to make that assertion. The theory goes like this. The pressure gradient encountered by divers when ascending from even relatively shallow depths, and for short durations, is such that there still exists a decompression risk. Although rare, data show that divers have been and continue to get bent even when diving well within the no-decompression limits. In diving, the no decompression limit (NDL) represents the maximum bottom time for a given depth, that a diver may stay without being required to make explicit decompression stops during ascent. Before I go on, the 3 minute safety stop you learned during your open water diver course is not considered a decompression stop because it is not technically mandatory. I’d adds safety to your dives, but is not included as part of the mathematical wizardry used to calculate the no-stop limits. As an example, the PADI Recreational Dive Planner allows a 55 minute bottom time (sea level, salt water, first dive of the day) on a dive made to a depth of 60 feet. Thus, the NDL or no-decompression limit at 60fsw is 55 minutes, regardless of whether the diver makes a safety stop or not. Back to the topic. The argument is in the terminology. PADI, in the new Open Water Diver course for 2014 has stopped using the term “no decompression limit” in favor of the term “no stop” limit. It has been suggested that describing such a dive as no stop is not only confusing, but inaccurate. I personally side with PADI on this issue. Arguments opposed to the idea that every dive is a decompression dive, included a list of natural occurrences that result in a pressure gradient relative to human tissues. Additional points about the affects of flying were made as well. However, none of these (with the possible exception of data related to U2 pilots above 70,000 feet altitude) result in a pressure gradient anywhere near that, which even a shallow water diver experiences. Even our diver at 60 feet, does in fact, have a decompression obligation. (Notice I said decompression obligation, and nothing about decompression stops.) It is in the form of a slow ascent rate. Most agencies recommend an ascent rate slower than 60 feet per minute. Further, it is standard among many agencies to recommend an ascent rate of only 30 feet per minute. Regardless, a slow ascent is not optional, specifically for the purpose of decompression. 60 feet (or 30) per minute is the accepted standard by which divers can reasonably expect to off-gas nitrogen at a rate faster than what would result in bubble formation. In other words, fast ascents can get you bent, even if you are well within the no decompression limits and defined by dive tables. Therefore, if it is possible to experience decompression sickness (the bends), even on “no decompression” dives, is it accurate to refer to them as “no decompression?” I say, no. These are “no stop” dives, yes, but to be safe, the diver still must undergo sufficient decompression, just in the form of a slow ascent. As a final case in point, what happens to a diver that bolts to the surface from say, 100 feet? The obvious answer is, he is very likely to experience a DCS (decompression sickness) episode. Why? Because of adequate decompression. Therefore, all dives are decompression dives. Agree or not? 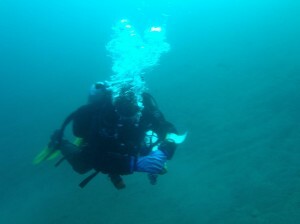 This entry was posted in Diving Safety and tagged diving safety, ndl, no-decompression, no-stop, PADI, scuba instruction. Interesting site! I am a diving beginner and I’ve read the post about the novel in the 90m-depth-habitat. How is it that you say for the ascent there will be another 25 minutes of NDL-time? I think it depends on how long the characters stay in their underwater habitat, doesn’t it? If they stay there for less than 12hrs before going to the surface again, it’s considered as a repetitive dive, isn’t it? Same for the next descent. So the characters have to consider that, too, when planning their travels between the underwater habitat and the surface activities. In the title there’s the question: No Stop vs. No Decompression. Which is correct?” Actually that was the reason why I came to this site, ’cause I have the same question. Unfortunately I can’t see any answer to that issue. My question is precisely: What’s the difference between no decompression time and no stop time. Is there any or is it the same? For clarification, the depth mentioned in the comment is 90 feet, which is a little under 30 meters. At that depth the NDL is 25 minutes. Basically, since the habitat has the same ambient pressure (1 ATM) as the surface, we’re really only concerned with getting there and back. You are correct that it would be considered a repetitive dive if time spent in the habitat would be less than 12 hours. The important thing is to control the rate of on-gassing and off-gassing. Sudden pressure increases would, at minimum, create problems equalizing air spaces. Obviously, off-gassing too quickly carries decompression risk. I am sure my guesses oversimplify the physics in many ways. Back in the 60’s, Cousteau did work with habitats that were quite deep. Here’s a video about it: https://www.youtube.com/watch?v=tEB4B2kVXgc. I am not sure if it is a 1 ATM habitat or ambient pressure, but I’m curious now, so I think I’ll look into it. Finally, to directly answer your question: What’s the difference between “no decompression” and “no stop” time? There is no difference. In my post, I asserted there is no such thing as a “no decompression” dive. All divers must decompress. Recreational dives are planned such that a slow ascent allows sufficient off-gassing to be safe. In the last few years, PADI has begun using the term “no stop” dives in educational materials, but the term “no decompression” is used far more widely. Adding to the confusion, dive computers often display remaining NDL, or no decompression limit. All of these mean the same thing. Keep in mind, all tables and all dive computers assume you will be making a slow ascent. The accepted maximum ascent rate is 60 feet per minute, but there is a general shift toward making 30 FPM the standard. Your computer or table will indicate this in the manual or fine print. Thank you very much for your clear and precise answer and additional information. I really appreciate the way you explain things and distinguish linguistuc confusions – great! I’m currently working on a novel about a scientist developing an underwater habitat at 90 feet below the surface. The habitat is maintained at one atmosphere with an airlock/decompression chamber built in. I’m wondering if this is outside the safe range for a 30 feet per minute ascension rate or would stops be required. Hi Danny, If the habitat is maintained at 1 atmosphere, there would be no decompression obligation incurred during time spent there. Decompression is a consideration if your characters will be reaching the habitat using scuba. In that case, there would be some nitrogen tissue loading during the descent as well as the ascent back to the surface. On descent, entering the chamber would be no different than the diver ascending to the surface, so your chamber simulating a 30 feet per minute ascent rate is essential. From 90 feet, the no compression limit is 25 minutes based on most dive tables, so as long as your diver takes less than that to get to the chamber, no stops would be required. The same is true for the ascent. I would imagine you’d want your chamber to gradually equalize to 90 feet before the diver exits. That building of pressure would need to be counted as bottom time, so that, plus the actual ascent would need to stay under 25 minutes.